If you saw the bit on the Academy Awards where Jimmy Kimmel and Wonder Woman talked about the theater where people were gathered to watch a special screening of A Wrinkle in Time, you know that they were complaining that the theater smelled like marijuana. That didn't surprise me, as Madeline L'Engle's 1962 Newbury Medal winner is essentially a Pink Floyd album for kids without the music. Some have called the book unfilmable, though this is not the first time it's been tried, the most recent being a cheap television version in 2004. The story centers around a young girl named Meg Murry (Storm Reid). Meg is happy girl with two scoops of loving parent, one chocolate and one vanilla, who both happen to be brilliant scientists. One day her father, Dr. Alex Murry (played by Chris Pine) dissappears. Meg and her little brother Charles Wallace, so named because skipping the middle man and just calling him "Pretentious" would have been too on the nose, are ostracized at school because people think they are weird, but they are actually quite smart. In fact, Charles Wallace is a genuine prodigy, and Meg is very protective of the little guy. One day they recieve a visit from a mysterious neighbor named Mrs. Whatsit, played by Reese Witherspoon. Mrs. Whatsit makes a whimsical reference to the rather iconic "it was a dark and story night" opening line of the book, which was of course a nodding reference to Edward Bulwer-Lytton's 1830 novel "Paul Clifford", and you think this review feels rambling and unfocused, wait until you see the film. Mrs. Whatsit also mentions that there "is such a thing as a tesseract", which quite startles Mrs. Murry, who had no idea that Reese Withserspoon saw "Thor." From here, the popular boy at school starts lurking around Meg for some reason and then the kids meet Mrs. Who, played Mindy Kaling, and together with Mrs. Whatsit and the Mrs. Which, played by President Winfrey, they are transported to the magical land of Oz, or Narnia, Wonderland. Pandora, or whatever it is, where they find out that a mysterious black cloud called "The It" is being kind of a jerk. The film has a lot of baggage to deal with, between the crowd that is never satisfied with book adaptations, especially one that takes this many libeties with the material, and the fact that Hollydood progressives declared it an instant classic before it was even done shooting because they want to see director Ava DuVernay and her diverse cast succeed (as do I) , and the fact that the results are so hit and miss is combination of a very muddled story that has very little sense of flow, and a director who is hardly lacking in enthusiasm and vision but taking a very ambitious approach to a story that simply doesn't have blockbuster potential, regardless of the faniciful effects, buitl in fan base, star power and Disney label. If you've haven't read the book, you're likely to be cnfused a lot of the time. If you have read it, you're likely to be either appreciating the changes for the better or freaking out because what happened on page 34 was moved to the part that takes place on page 80, etc. Some of the changes are don't go far enough, however. For example, making the children adopted fits very well with the story, but I was expecting to see it explored as part of Meg's irrational insecuries of not being good enough for her brilliant family, and while it's great to see adopted children treated as the same as any children, this could have been a strong character element that might have made for a good message. The adaptation is likely to be polarizing, because L'Engle intended the book to have strong Christian themes ala C.S. Lewis, and they are much less overt here than in the book. When Mrs. Who's on First and Mrs. What's on Second speak of the valiant warriors they have sent in the past, Jesus is left out and Maya Angelou is added, which is likel yto offend some. Never mind that L'Engle herself was widely villified by more conservative Christians, or the fact that a strong argument can be made that it's not really disrespectful at all to Chritianity to TAKE OUT the part where Jesus is revealed to a magical fairy from another dimension . . . Anyway, the performances are charming, as Winfrey, Witherspoon and Kaling add a great deal of presence, and the child actors are terrific, though the characters are pretty flat to become truly invested in. Pine does a good job, as does Gugu M'Batha-Raw . The prodcution desing is gorgeous, but the effects didn't always work for me. Part of that may have been the fact that we saw it in IMAX 2D, and they effects were designed for 3D (I'm very much ok with theaters backing off on the over emphasis on 3D, especially if they are placing it on IMAX instead, but effects simply do not look the same as those designed for 2D, and we either need to shift away from 3D or present the film as it was meant to be seen. The score by Ramin Djwadi (Iron Man, Pacific Rim, Game of Thrones) it s quite lovely, and proof that like Danny Elfman and Hans Zimmer before him, just because directors and studios latch onto one style from a composer does not mean they aren't capable of doing something different. The constant songs are a bit annoying: they aren't bad, but it the constant use of songs in film either feel irrelevant or become a crutch as an easy way to get across the mood of the characters, and here it manages to do both at the same time, and ulitmately they are there just to sell an album. 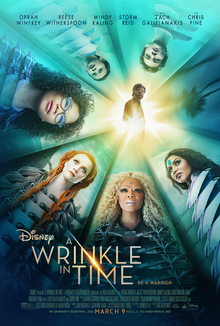 Still, all in all, A Wrinkle In Time is a watchable family film, but it's too rushed and too hampered by the problematic source material to ever truly achieve being a genuine crowd pleaser.